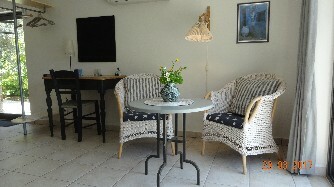 The apartment is situated in the basement of our private villa, with a separate entrance to your own comfortable holiday space. The emphasis is on comfort and homeliness, from the overall design to the cozy furnishings. 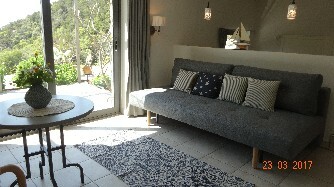 The layout is open plan (50 sqm) with a bedroom with two single beds, a double sofa bed. Outside there is an additional bed for sleeping. A baby cot and is available on request. 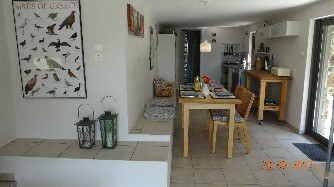 There is a fully equipped kitchen with a fridge/freezer, microwave oven, two hobs, a hot water kettle and a flat toaster. 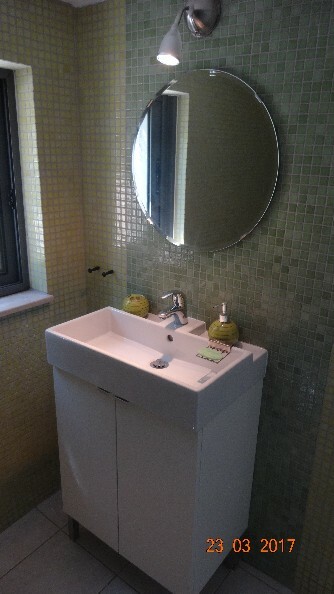 In addition, a non-traditional bathroom with shower, hairdryer, washbasin and toilet. 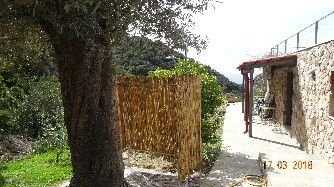 There is an outdoor shower for the very hot days. 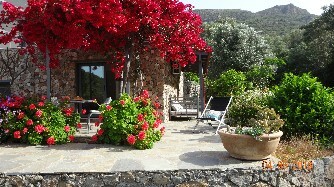 There is a small covered terrace and a larger one with a bougainvillea. Both from inside and outside you have a beautiful view to the evergreen mountains and the Libyan sea. 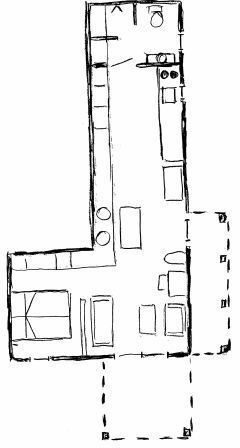 As you can see in this simple drawing of the layout, the bedroom is located to the west with a view to the Libyan Sea, and there are terrasses with table and chairs to the west and east. This is the sitting area with a desk and chair. 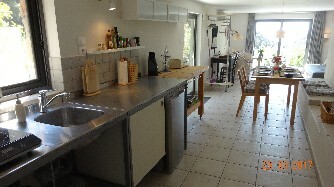 The kitchen is fully equipped, giving you the possibility to cook your own meals, with a mini-oven and 2 hotplates and refrigerator with a small freezing compartment. 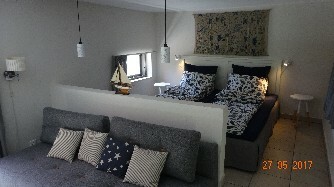 The bedroom with 2 single beds is a step up and separated from the living room with a half-wall. 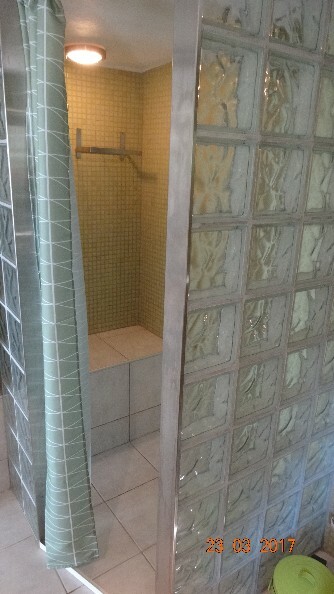 The shower is generously spacious, with enough room even for seating behind the glass wall. Here is the bathroom sink with all that's necessary, also an electric socket for shavers and so on.